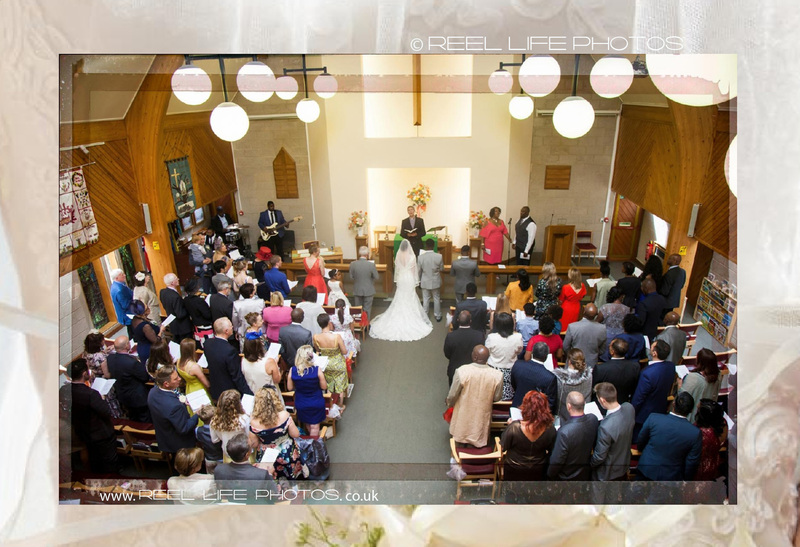 Storybook album design from wedding pictures in taken in Leeds – The front cover. 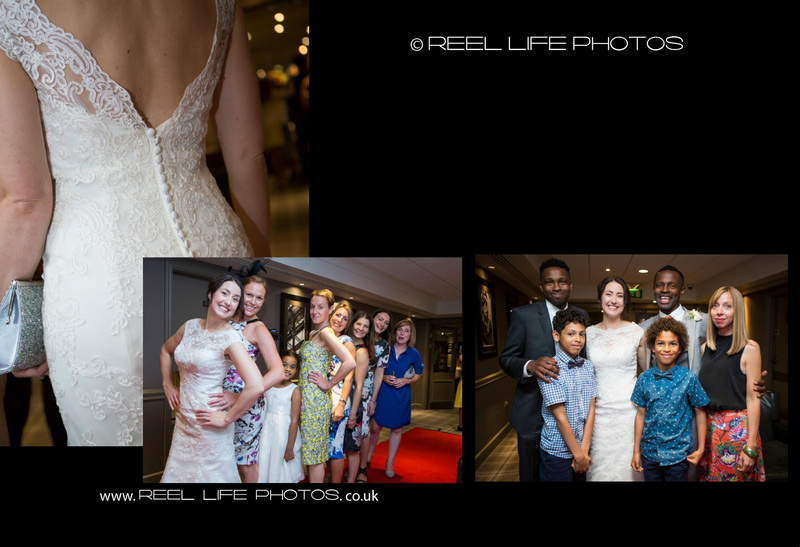 This lovely couple found some of the many wedding pictures I’ve taken on Reel Life Photos on Facebook Page. 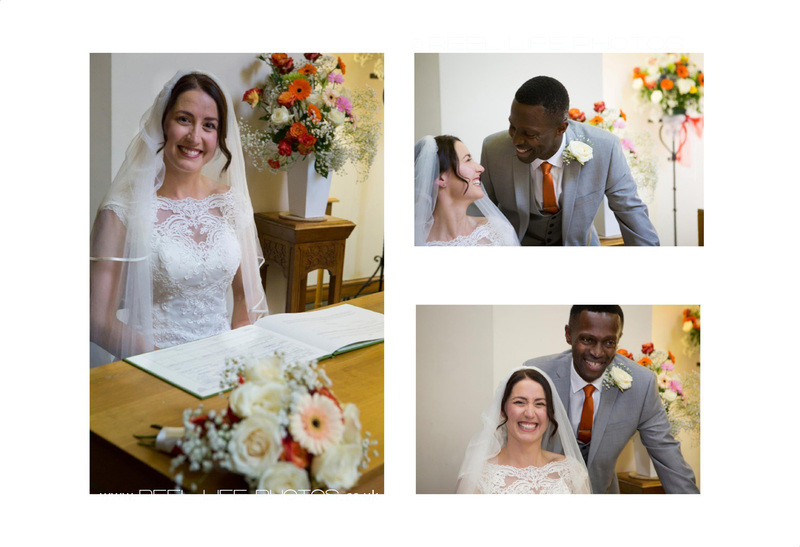 They love photos so I was delighted to be their wedding photographer, and to have the opportunity to share their special day. 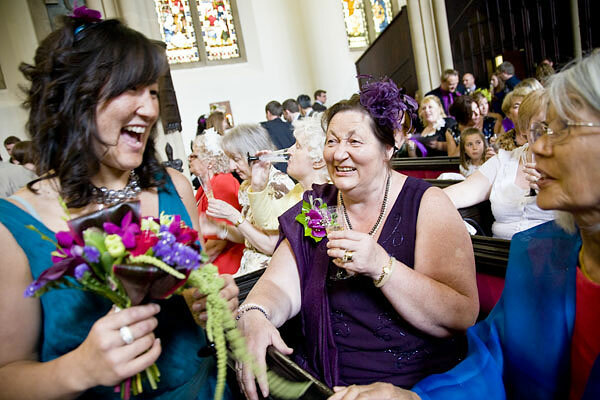 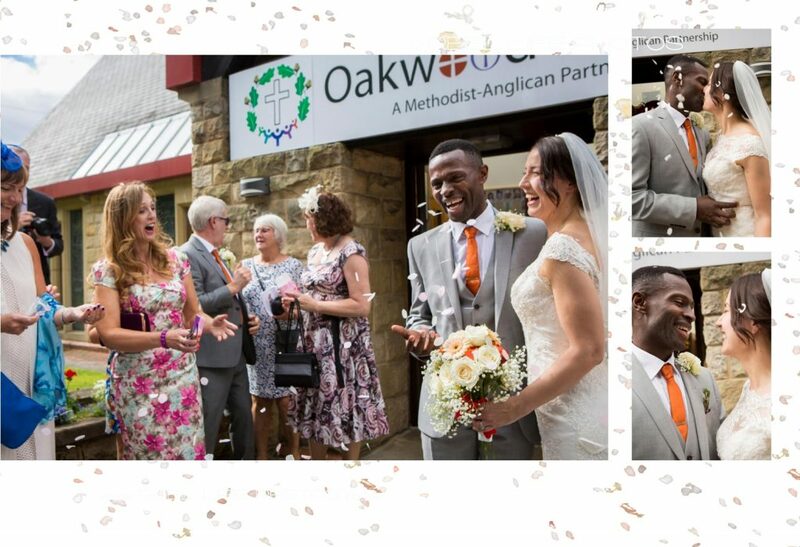 So much fun an laughter – from them and all their wedding guests! 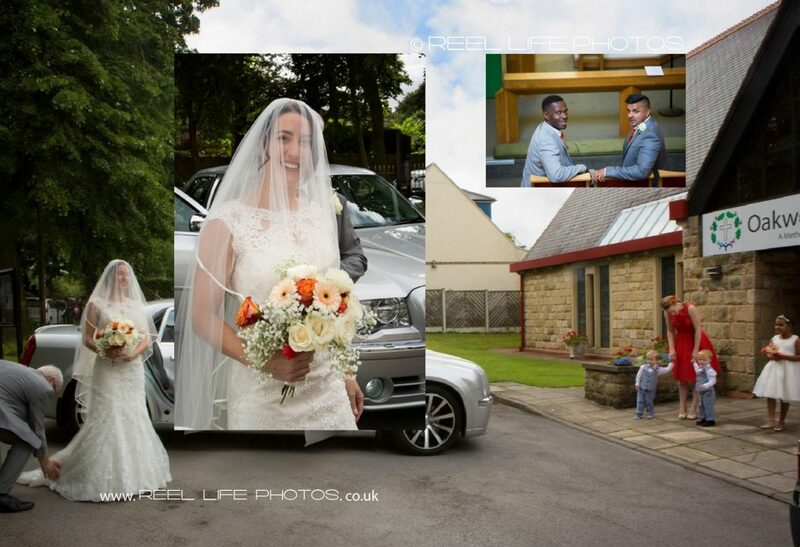 They were so keen, they came to see me almost straight after their wedding, as couldn’t wait to see their pictures! 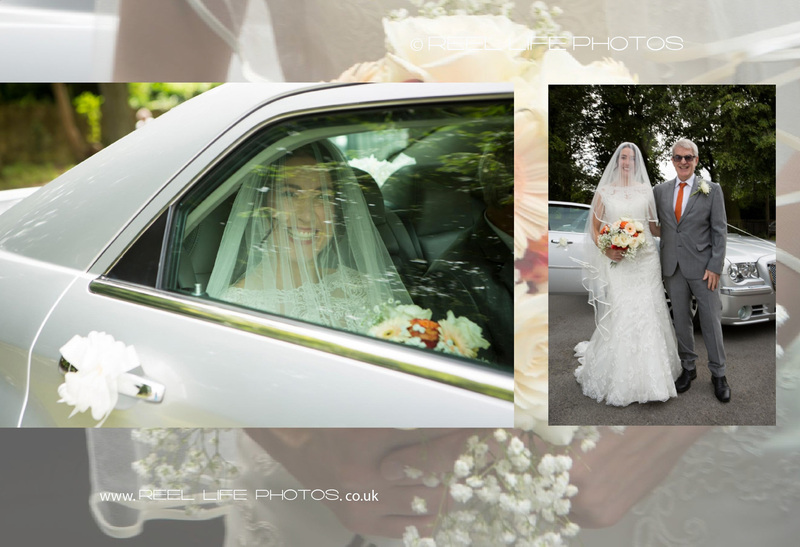 They initially chose 650 favourites, which they would have loved to have had include in their wedding album, but gradually whittled them down to a more manageable 127 images. 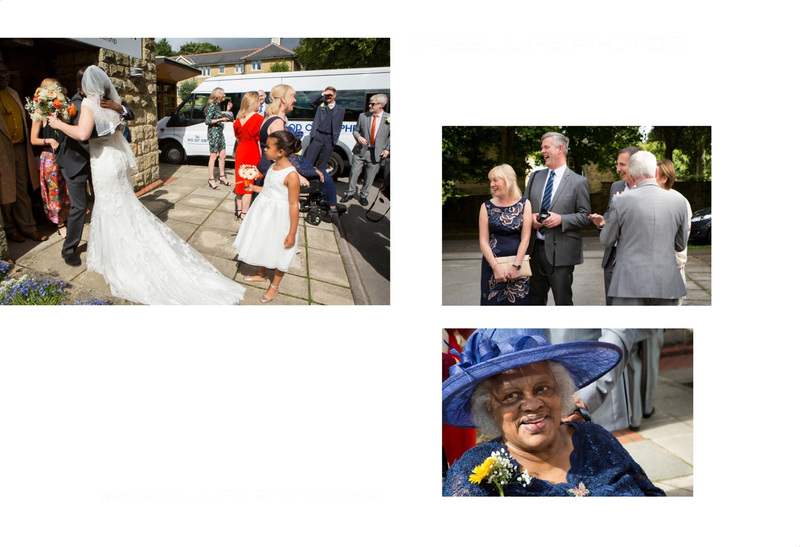 I then added a few back in to use as backgrounds to make the story of their day more complete. The church minister wouldn’t allow me to take photos from the from of the church as I normally do, but with my long lens from the organ loft at the rear, I still managed to get a few basic shots, though not the facial expressions I had hoped to capture. 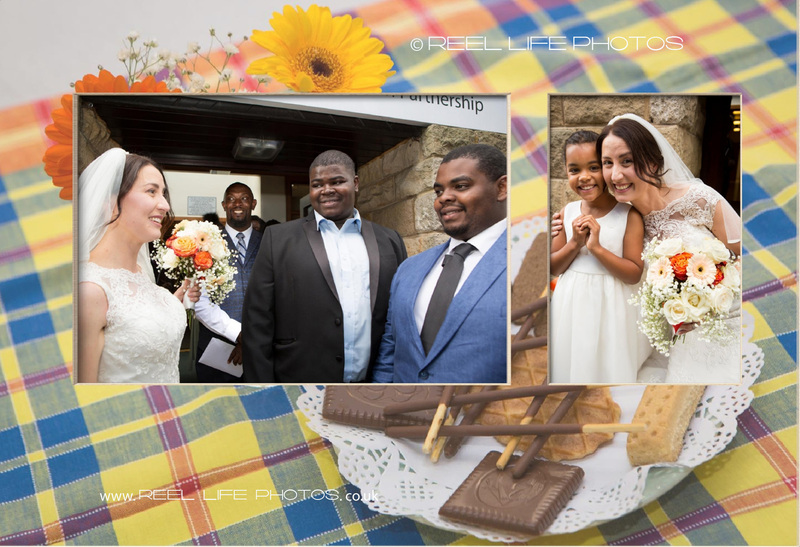 The church warden put on a feast of tastefully arranged chocolate biscuits on every table in the church hall afterwards, at her own expense too, so can see the couple are much -loved here. 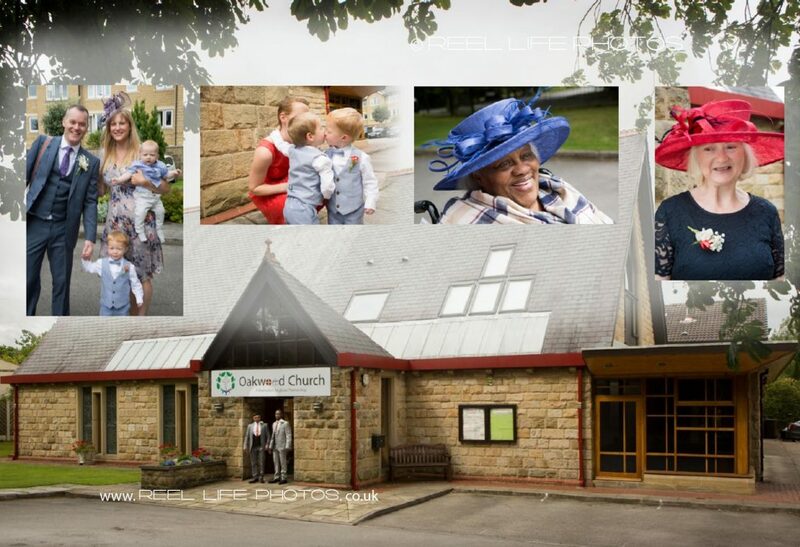 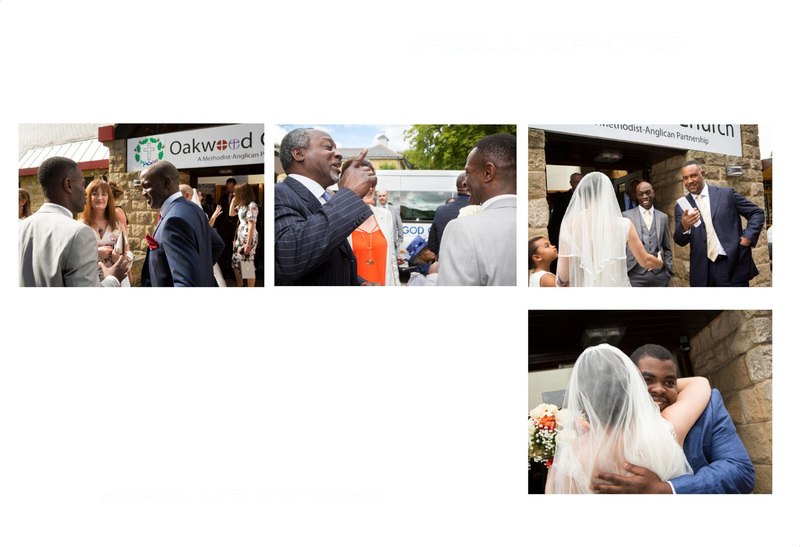 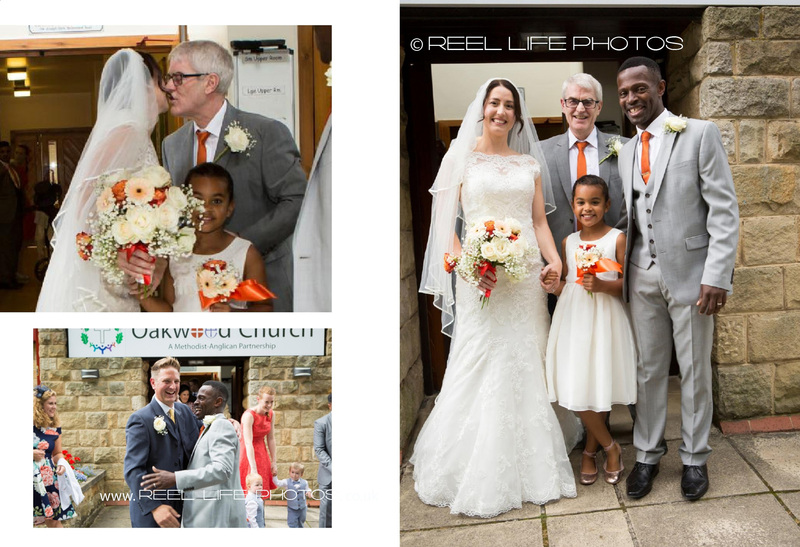 Start of the day at Oakwood Church in Leeds, as the wedding guests arrive. 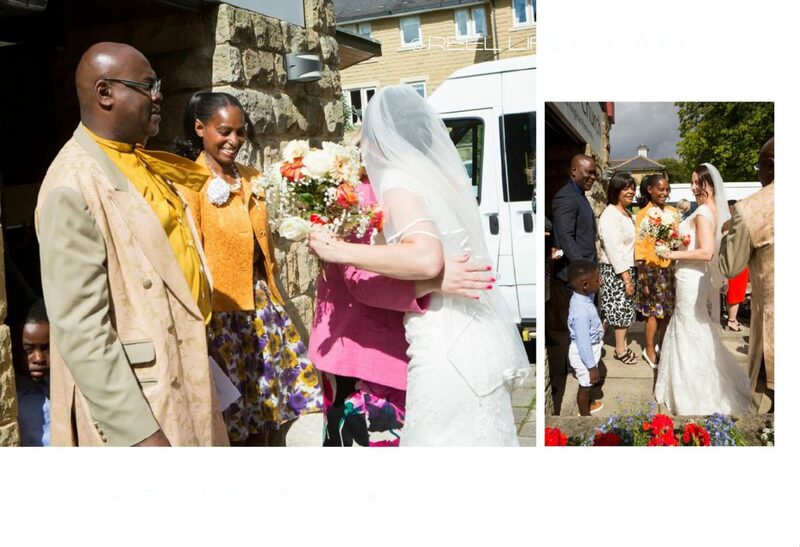 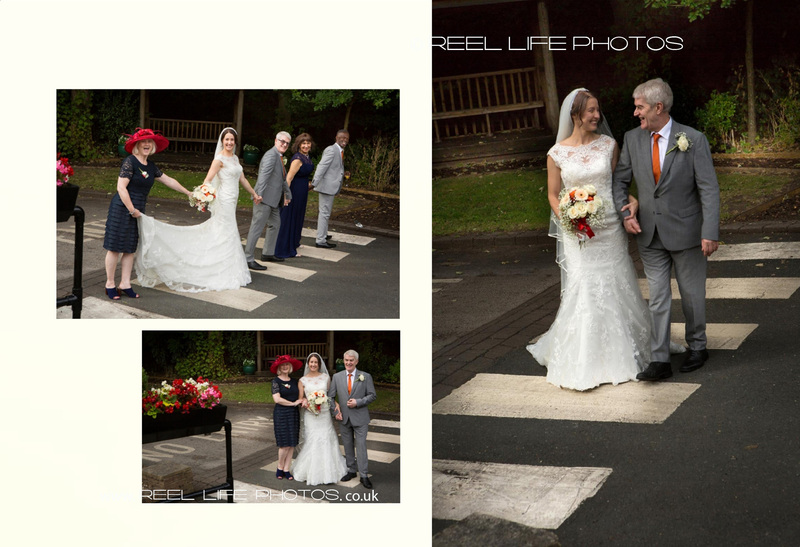 Congratulations to the bride outside Oakwood church in Leeds on a lovely sunny August day. 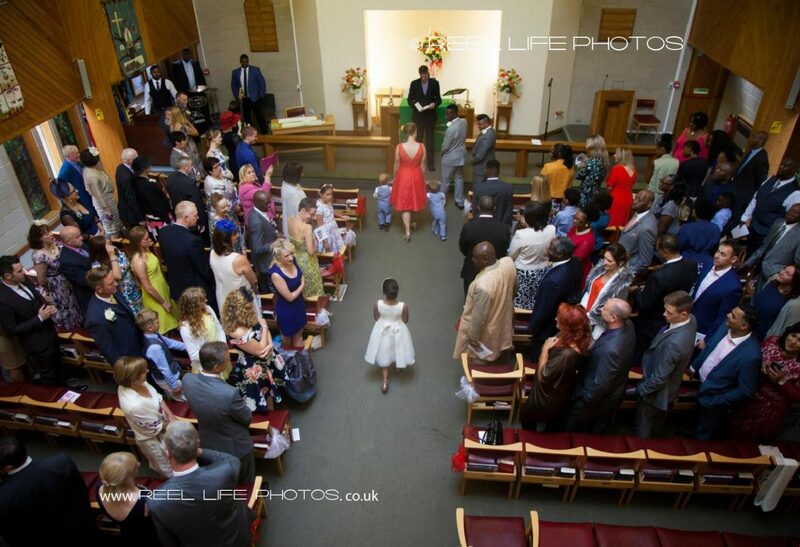 The bridesmaid, flower girl and page boys walk down the aisle first, as seen from up in the organ loft at Oakwood Church in Leeds. 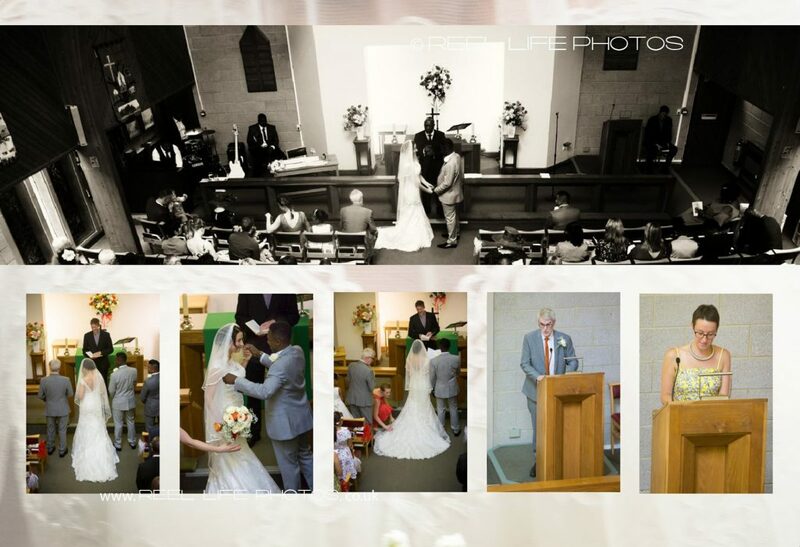 The kiss and extra blessing pics in storybook wedding album. 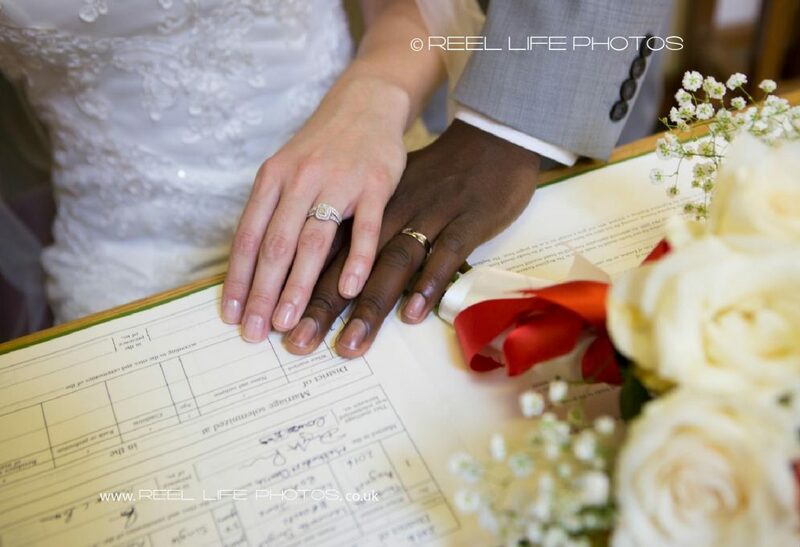 Reel Life Photos signature image showing the bride and groom’s hands and rings on the wedding register, next to the bouquet. 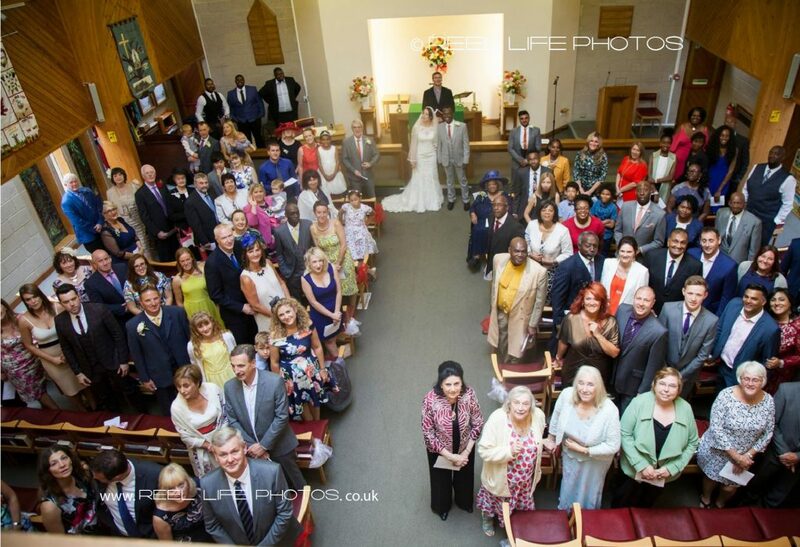 Big group shot – inside the church! 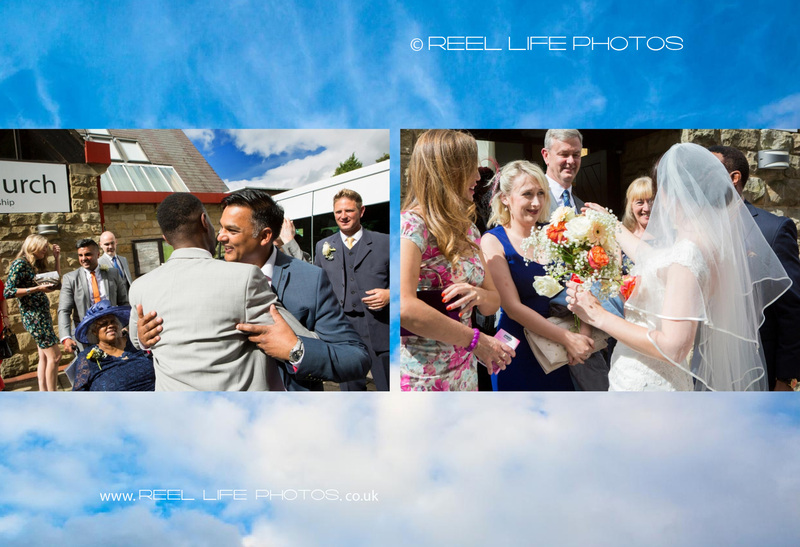 natural wedding pictures as everyone rushed to congratulate an hug the bride. 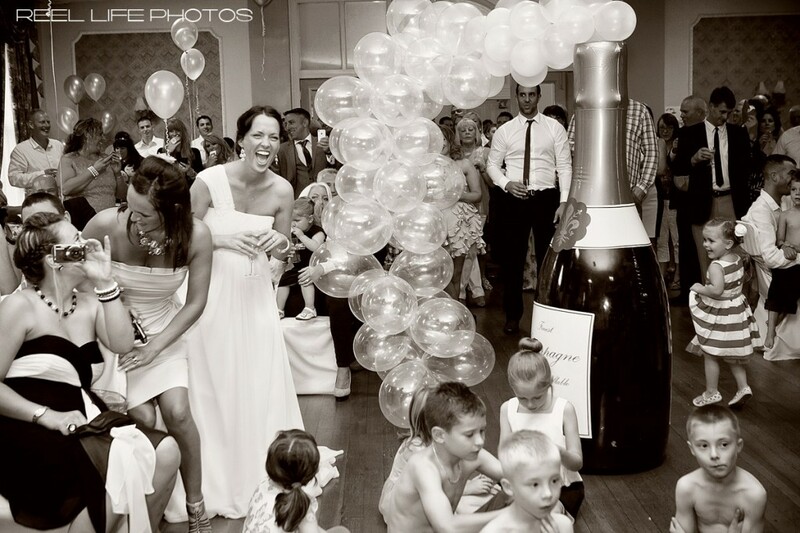 Love it when everyone throws confetti and the couple are enjoying the fun! 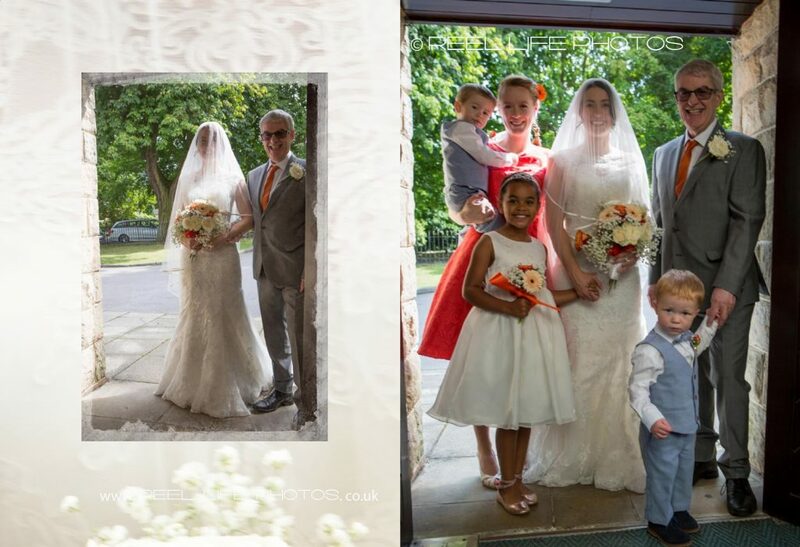 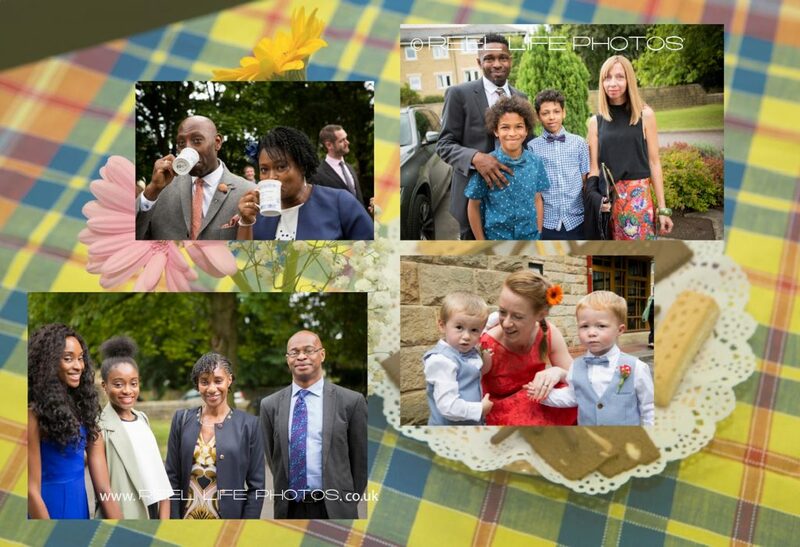 Tea and biscuits after the wedding ceremony makes for relaxed family photos too! 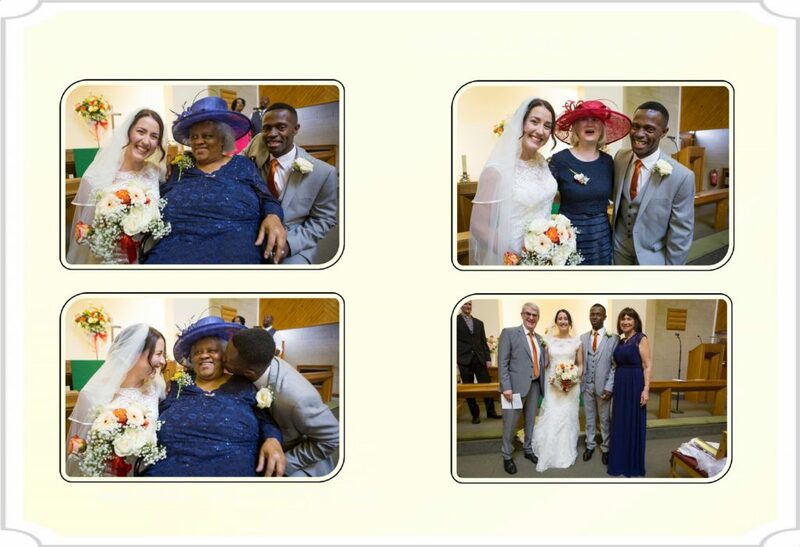 Mums are precious aren’t they! 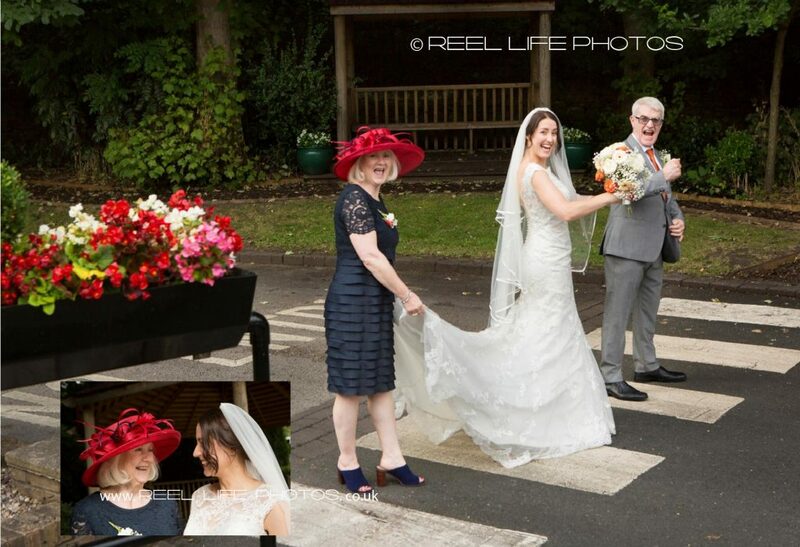 Lovely how both of the couple’s mothers managed to make it to the wedding! 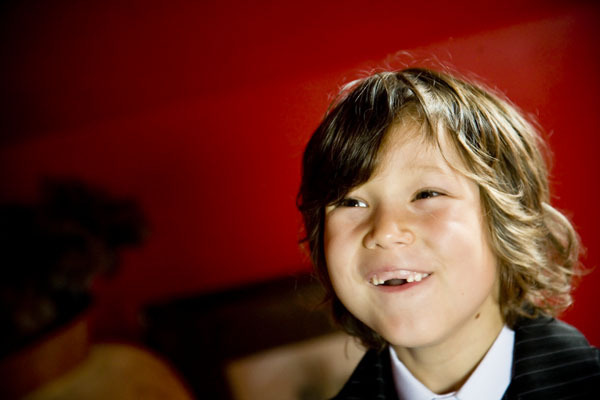 It just so happened that one of the bride’s friends brought a rather late Christmas present for the little boy, the bride and groom’s son Adam, and that was a joke box full of tricks. 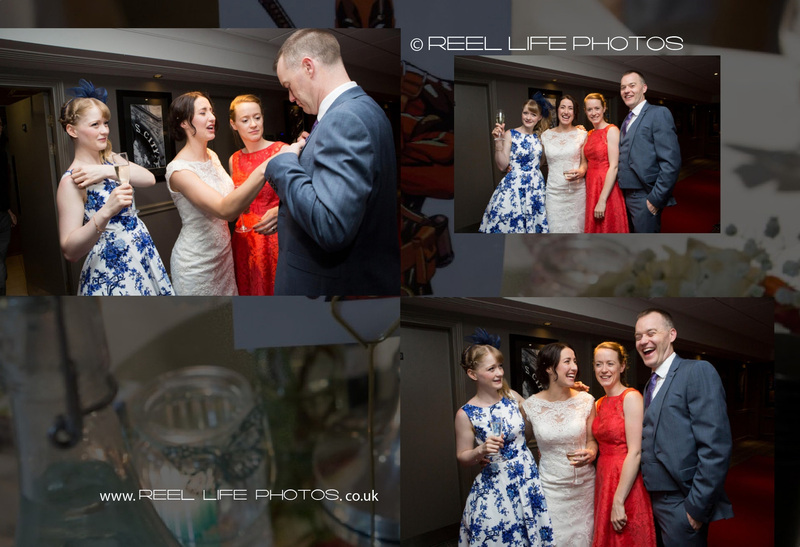 It kept everyone amused too, as you can see…! 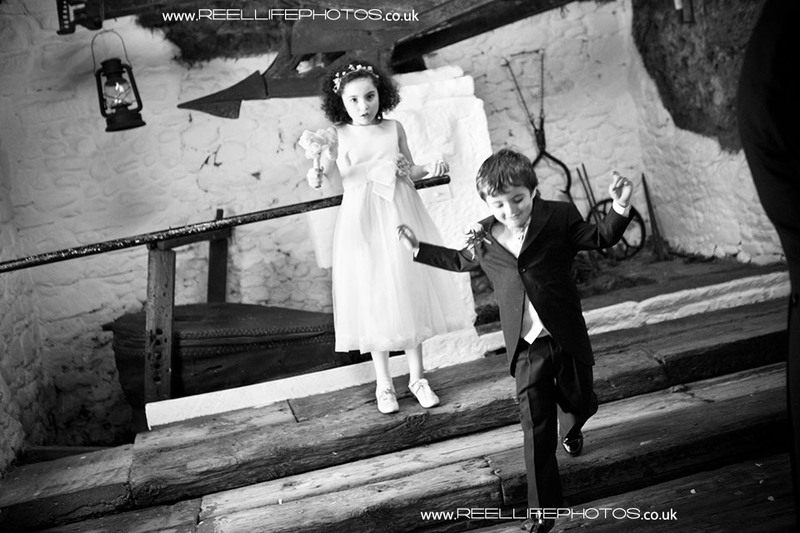 I think they liked playing on the steps while all the adults got on with wedding stuff! 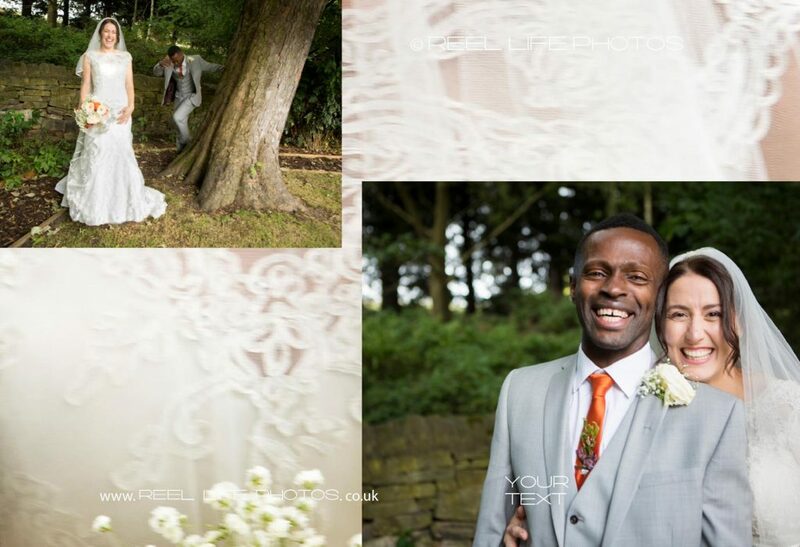 Such fun photographing this loving couple! 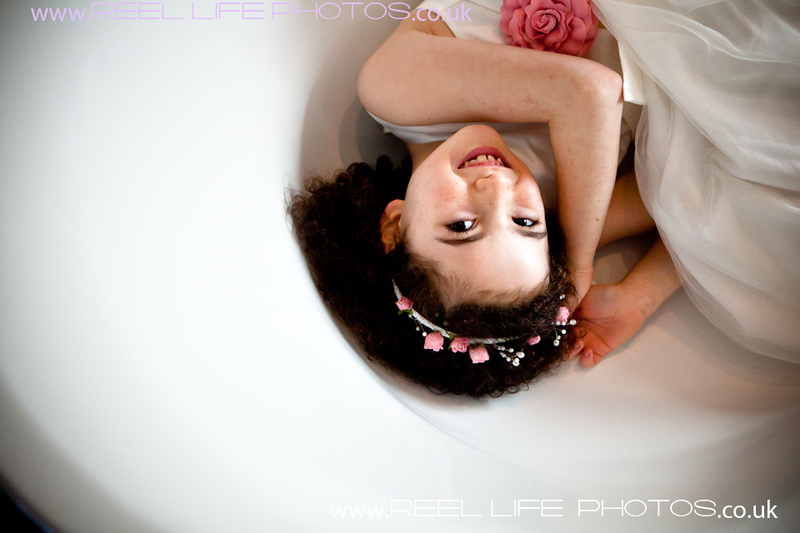 Amazing how beautiful the bride looks just while sitting on the bed in the Thistle Suite at Smiths Hotel in Gretna Green. 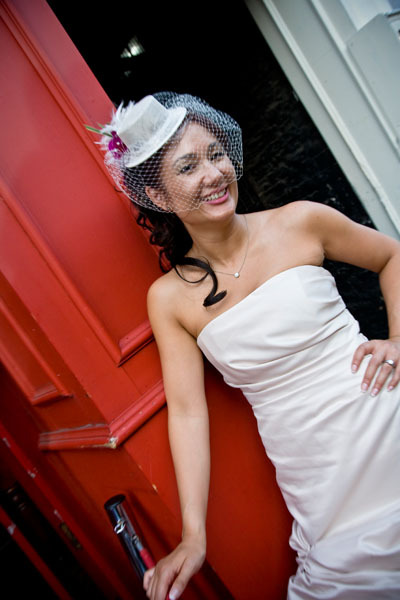 Lesya was the first bride Elaine ever photographed in 2000, so no wonder it was super special to have the opportunity to capture her again! 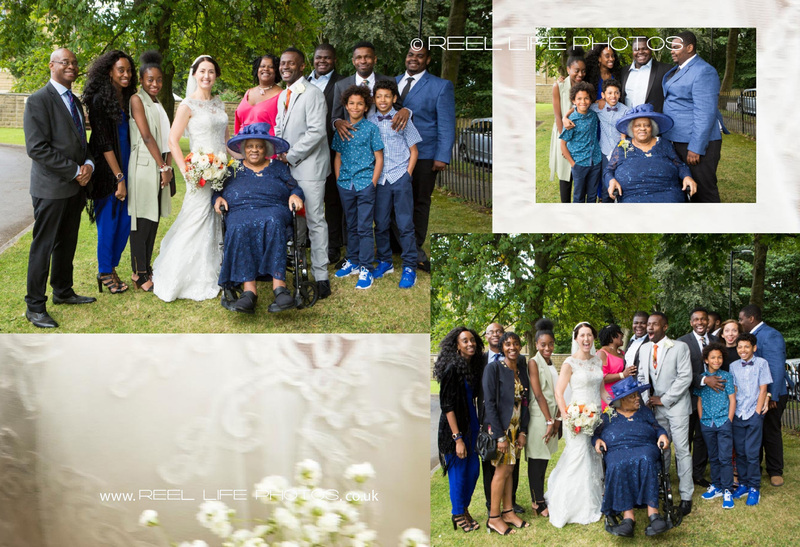 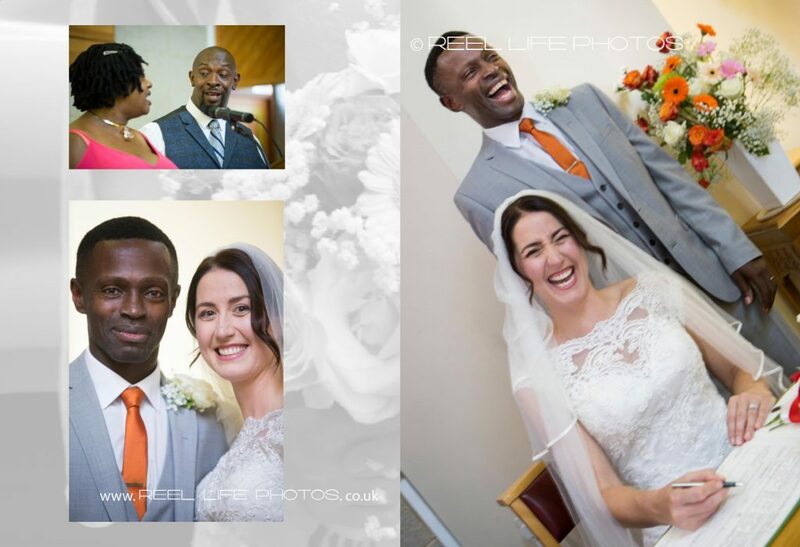 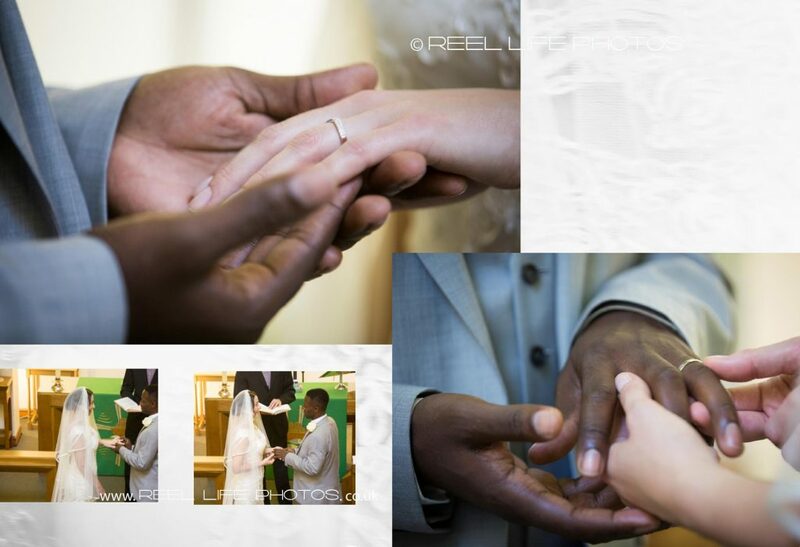 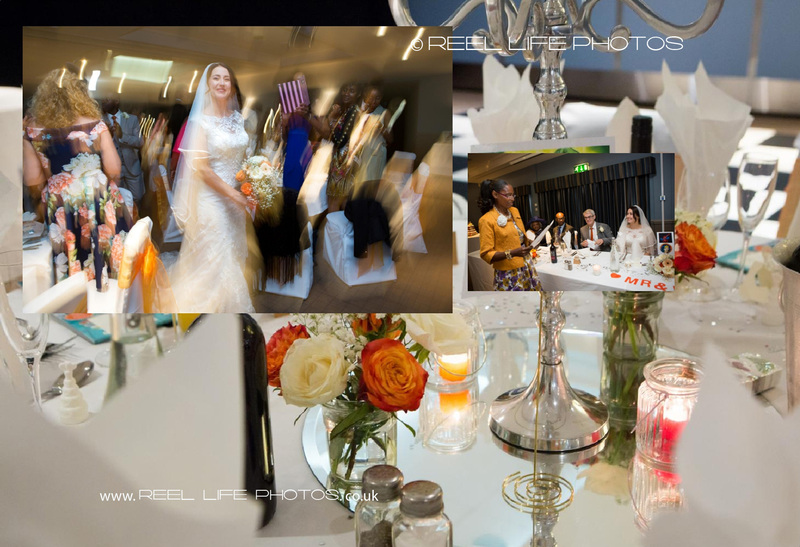 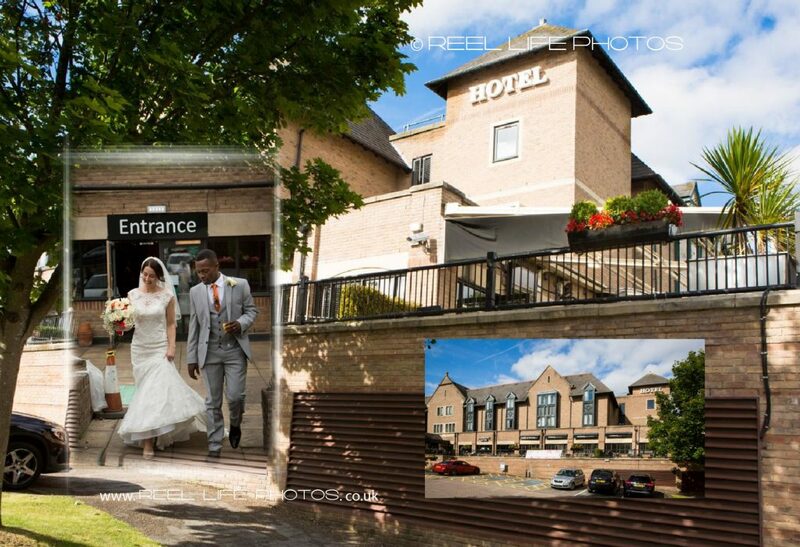 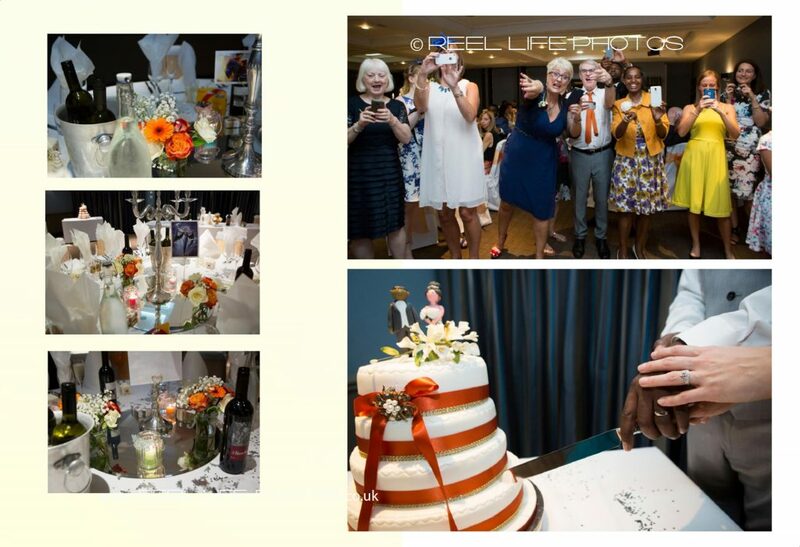 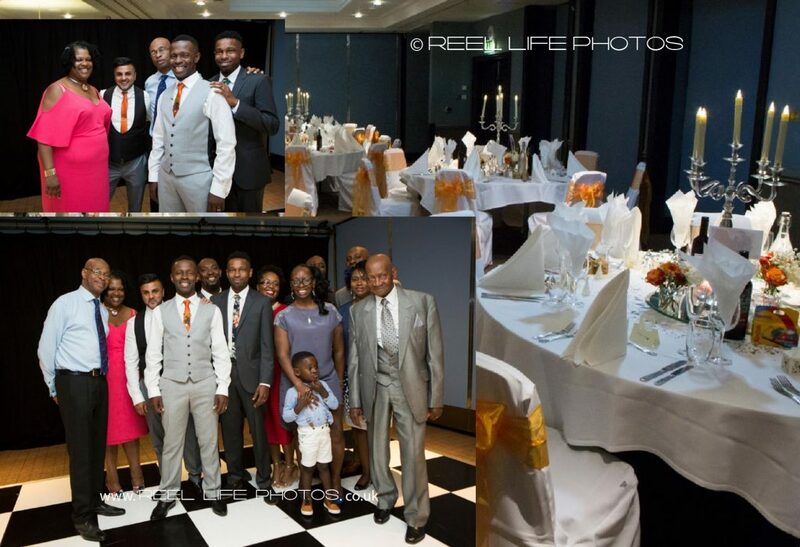 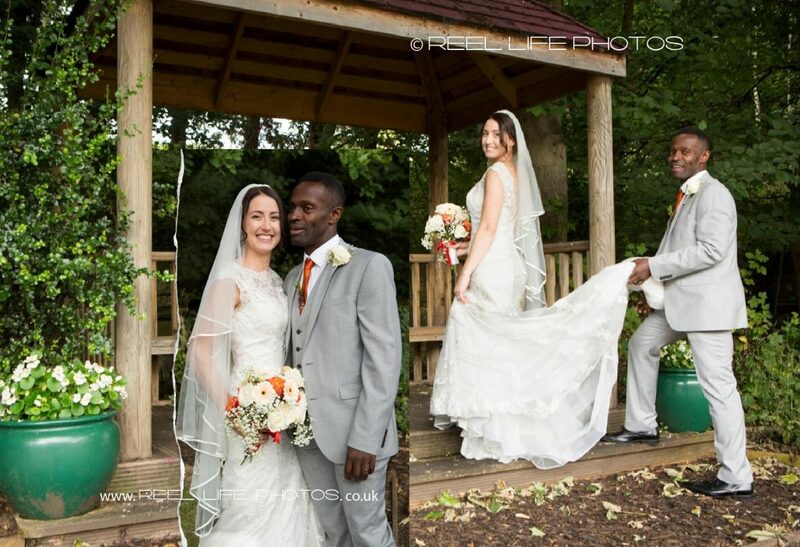 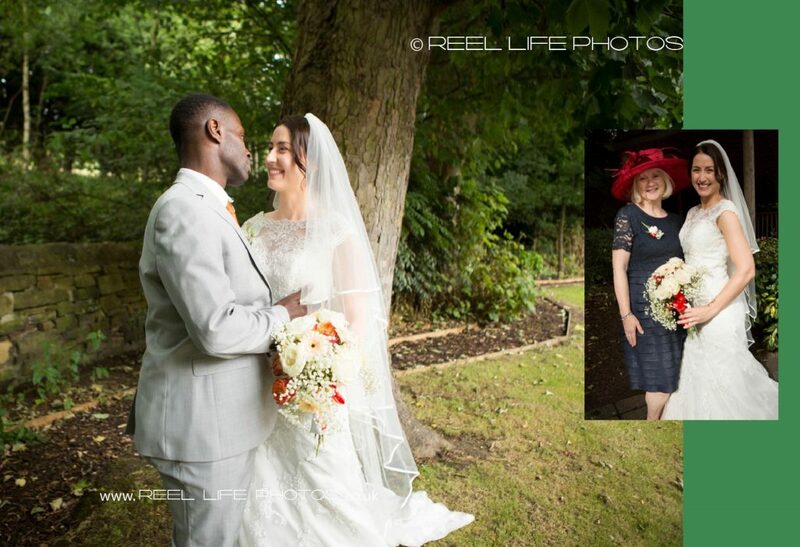 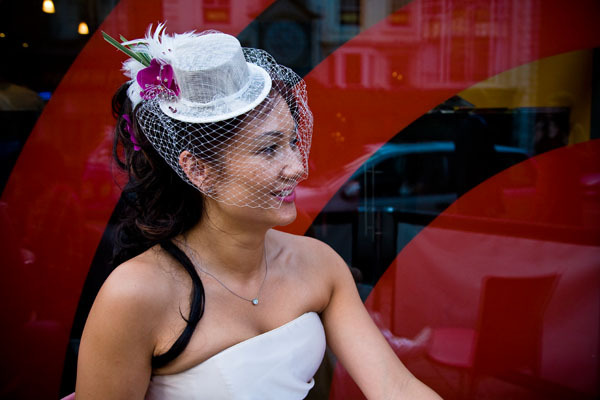 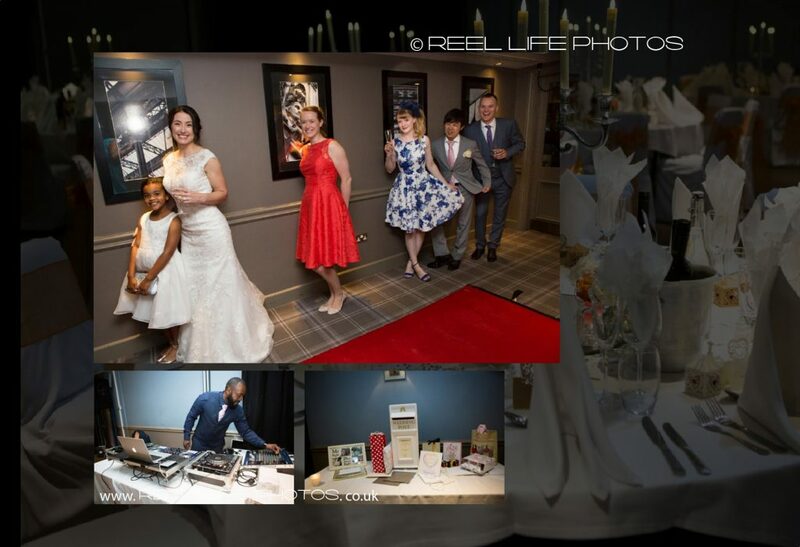 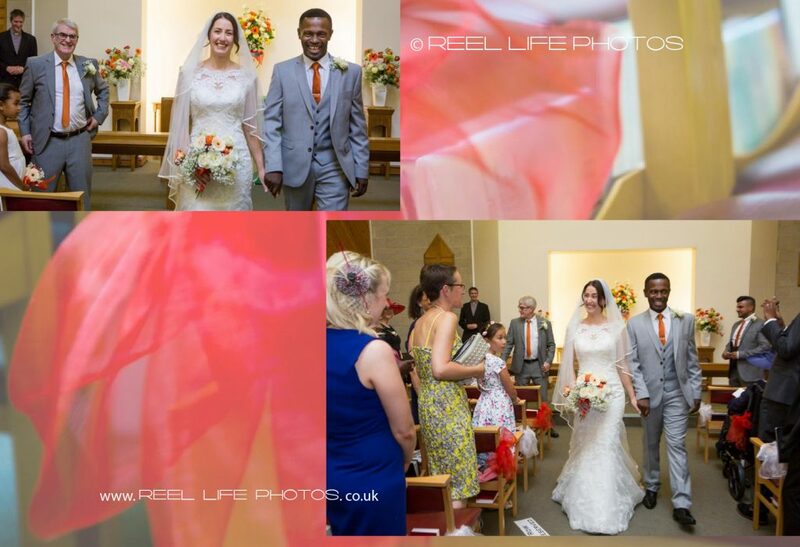 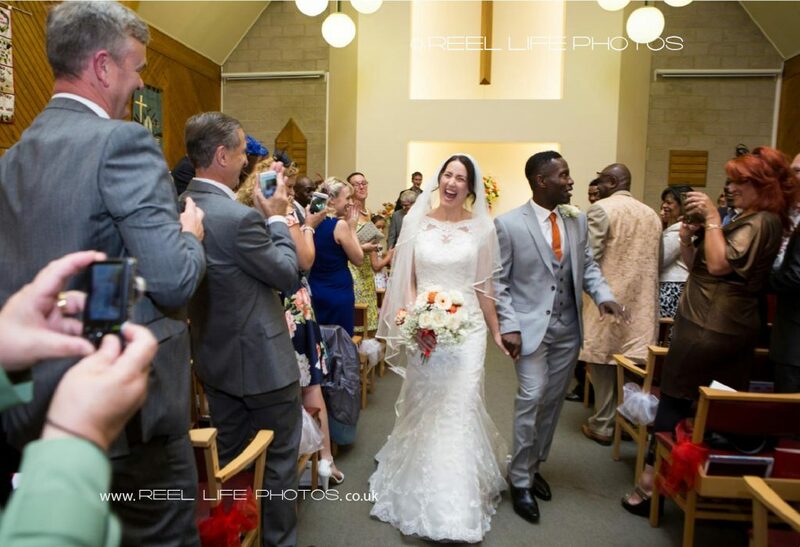 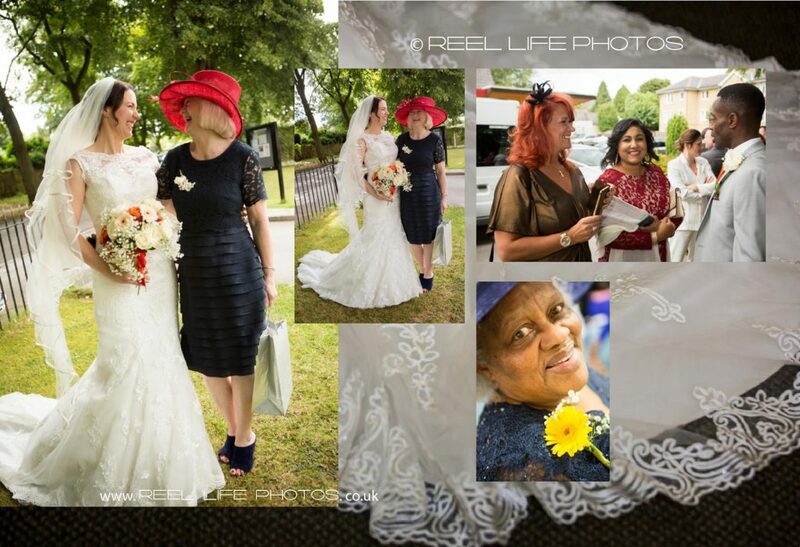 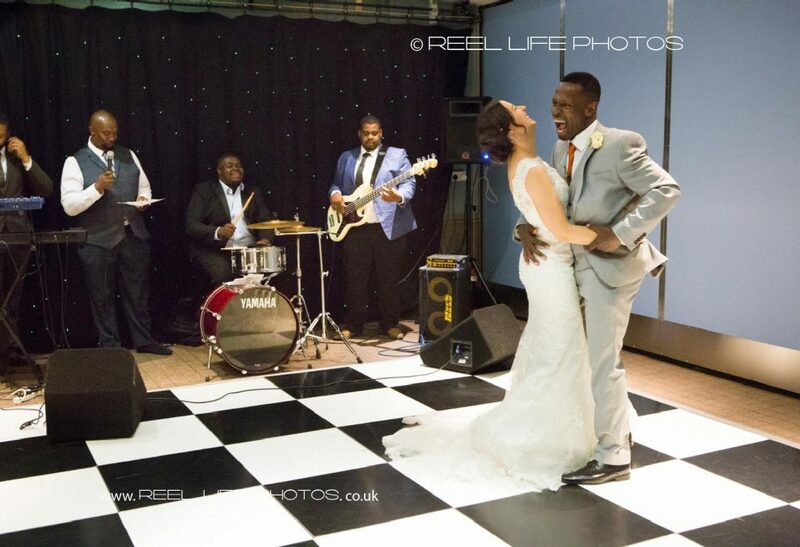 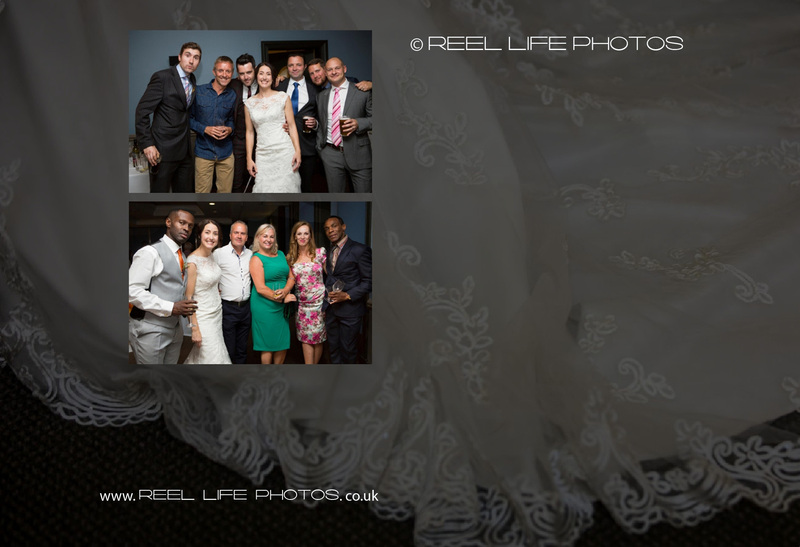 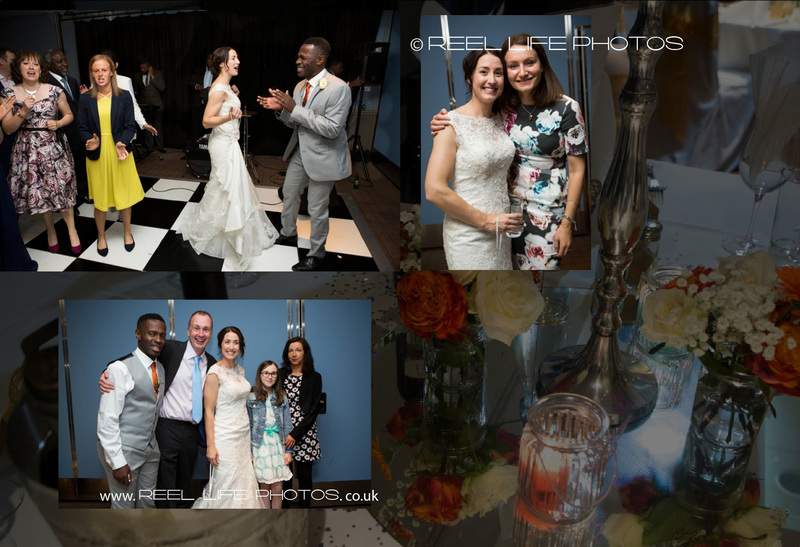 Contact Elaine of Reel Life Photos if you fancy having her to photograph your special day too! 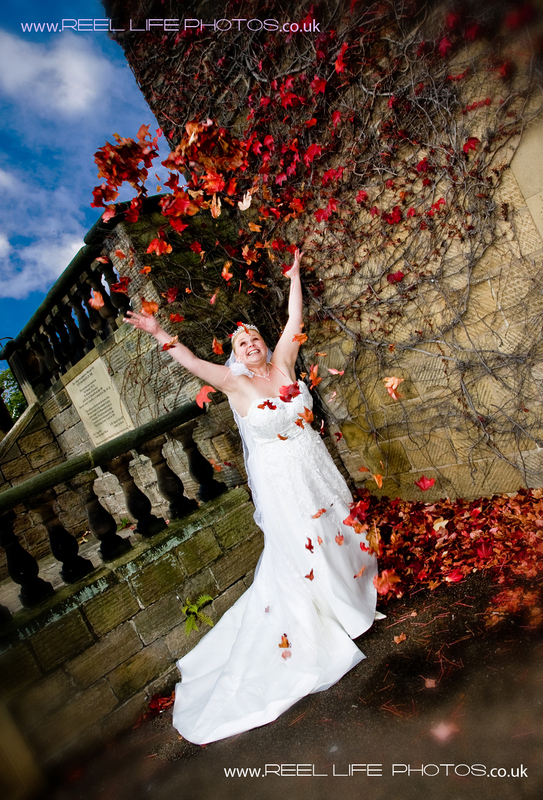 Fun with Autumn Leaves - well at least they were dry so our bride enjoyed doing this on her wedding day! 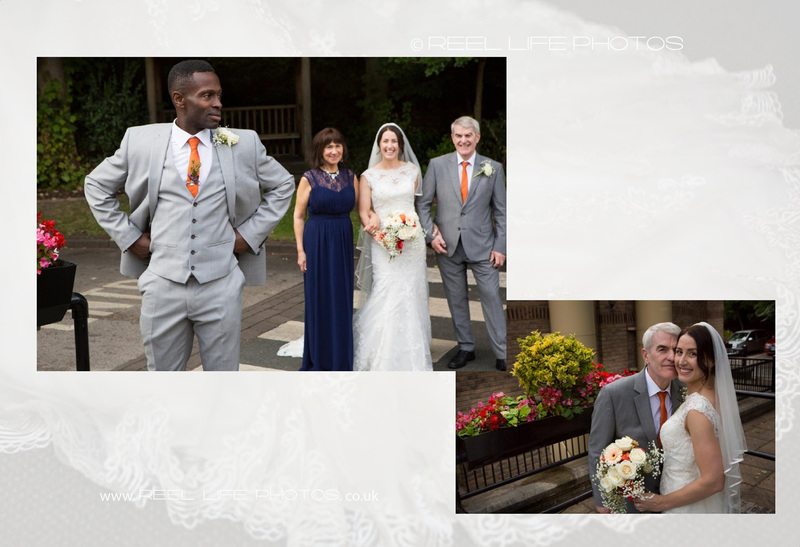 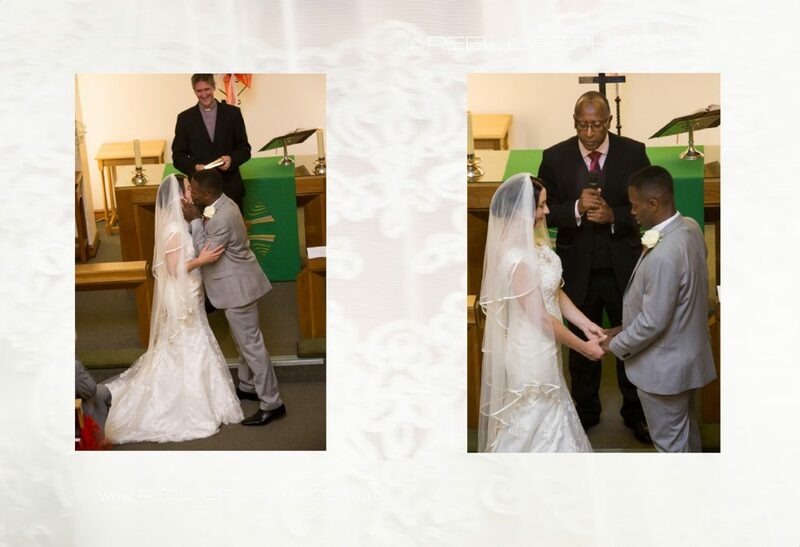 Michelle & Keiron’s wedding was very different from the normal mixture of posed family groups and reportage pictures that make up most weddings. 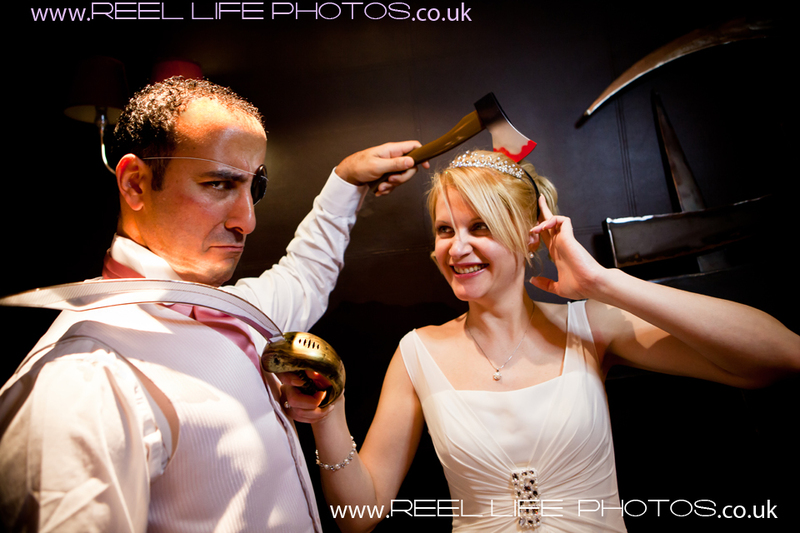 Starting at the bride’s house full of mirrors and black and white with red walls in the boudoir, I knew we were in for a fun day. 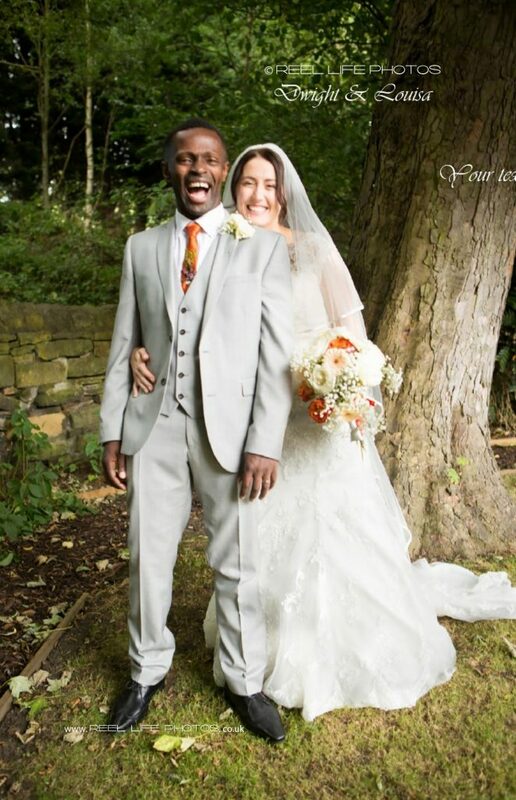 Michelle and I had never met in person till that moment – but had got to know each other through lively descriptions of her family life by email, the first of which arrived when I was in Egypt back in February this year. 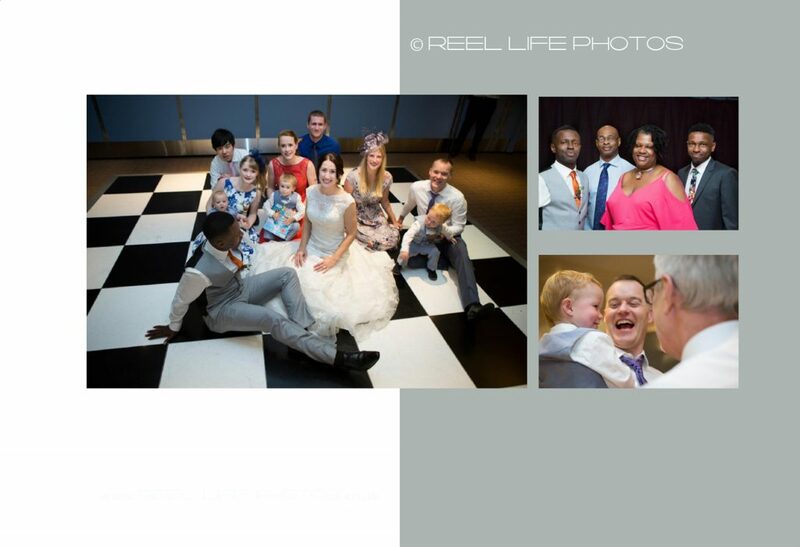 Michelle’s highly confident and fun little boys are the light of her life … They even gave her away and during the wedding reception did a double act delivering the funniest wedding speeches ever! 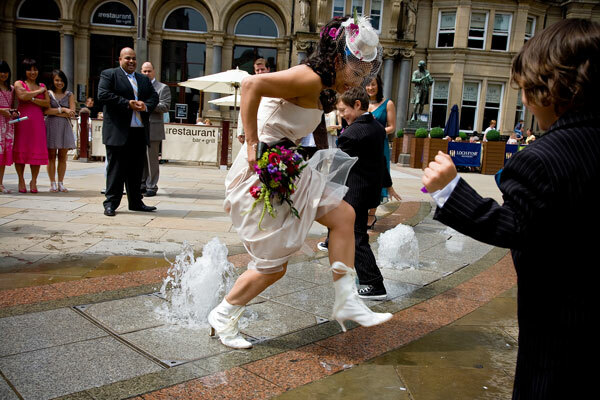 Michelle had a burlesque hen night so was not shy of showing off her lovely figure and flamboyant but practical wedding boots. 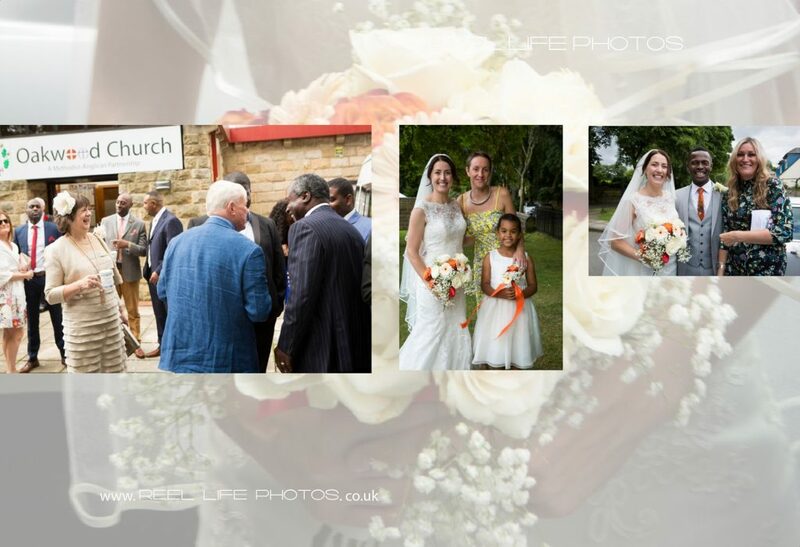 The vicar – Father Paul – at Mill Hill Unitarian Chapel in Leeds is no stranger to the media, as used to work for the BBC, so he was happy for the Jorge and me to move around during the service to get a good variety of shot. 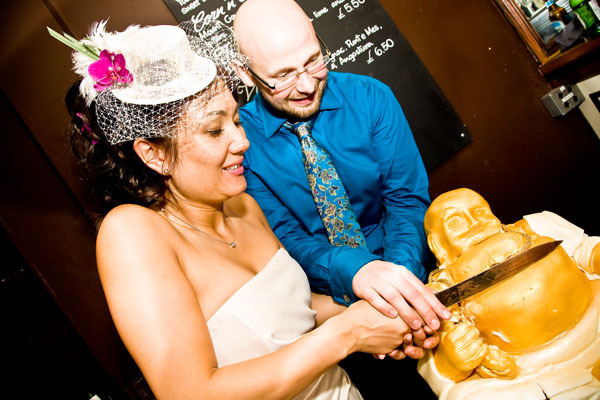 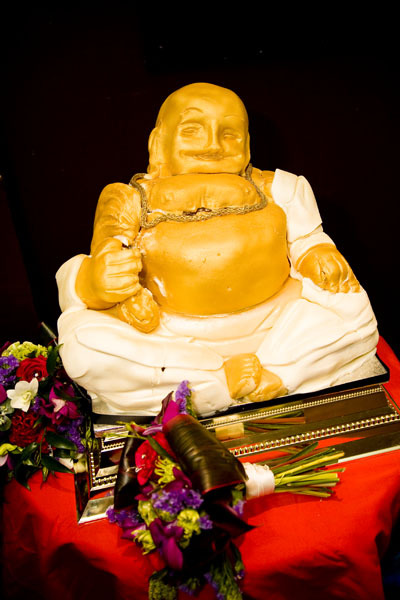 The whole emphasis being on making the bride and groom’s day. 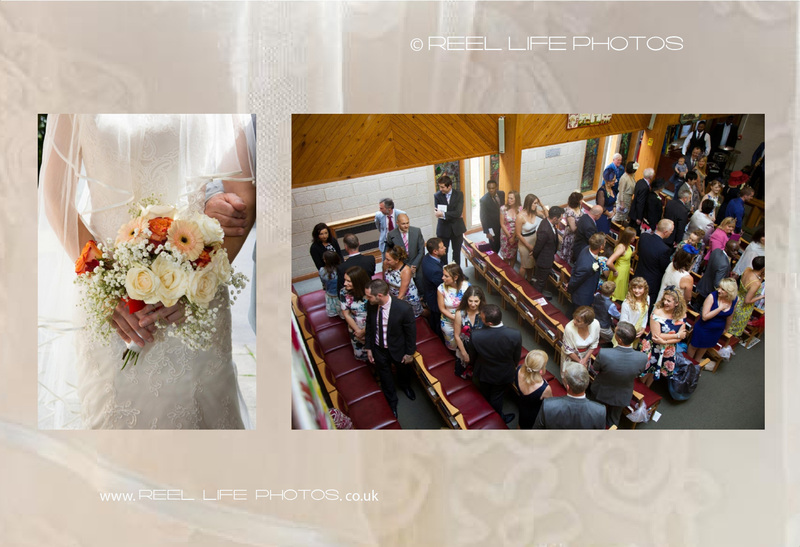 They even sat round chatting and drinking champagne in church with the guests after the ceremony! 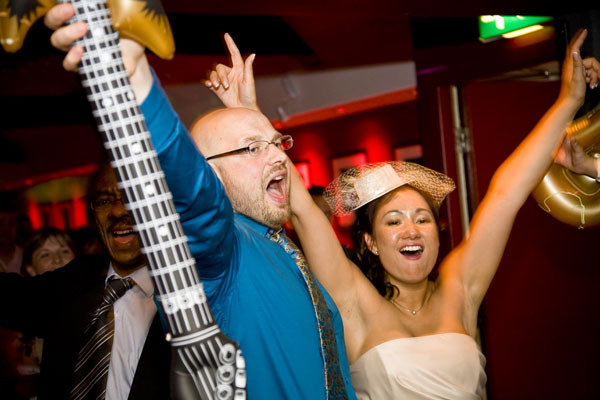 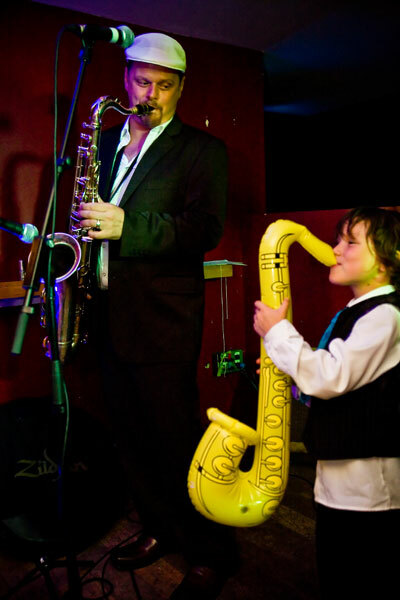 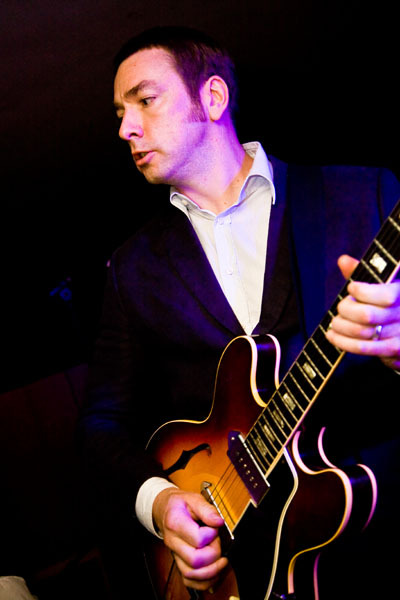 Fun band act during the evening wedding reception at Smokestack in Leeds. 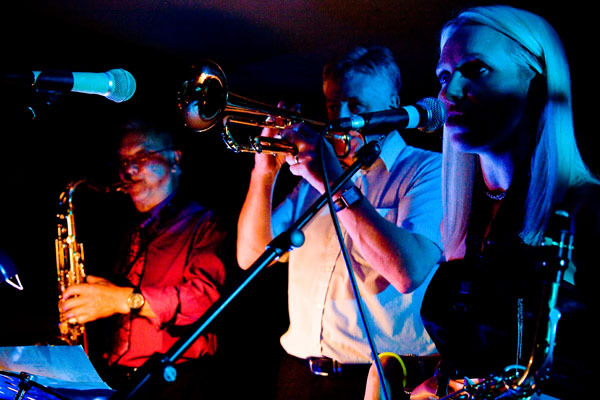 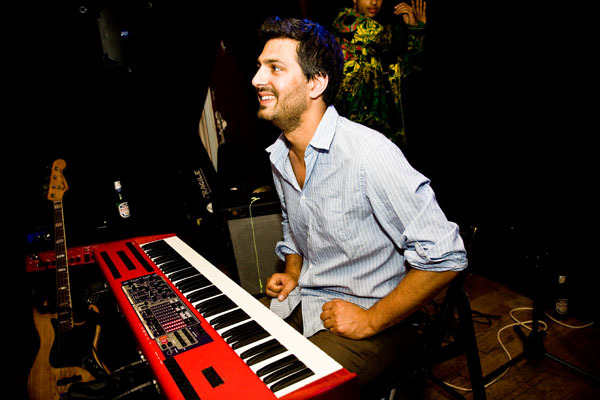 First band playing – taken without flash to reflect the true night colours. 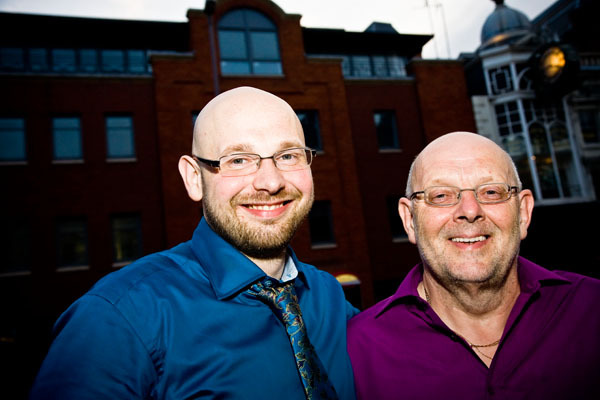 Bridegroom Keiron with his Dad outside Smokestack in Leeds during evening wedding reception. 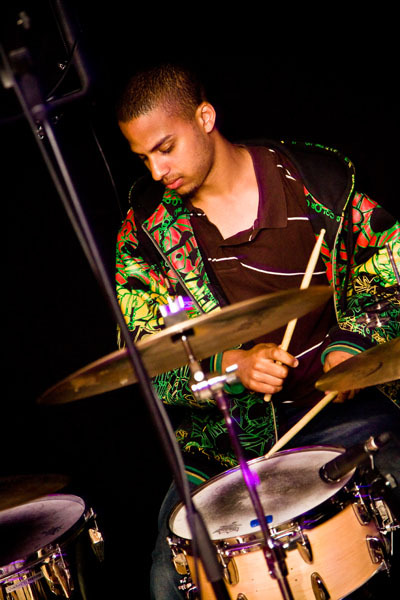 Drummer from second band during evening reception at Smokestack in Leeds. 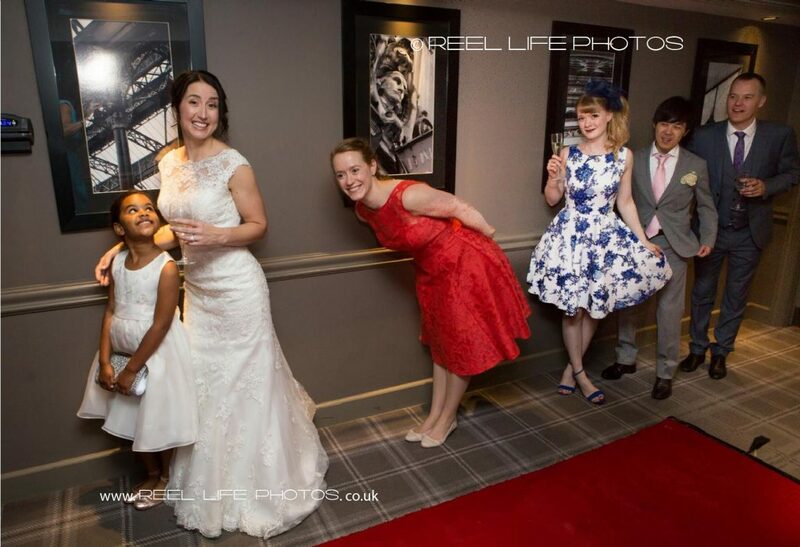 Michelle’s wedding guests get in on the act too!